This guide is intended to teach you how to convert your movie file to a VideoCD compliant MPEG-1 file using TMPGEnc for VideoCD authoring. TMPGEnc can convert AVI files, as well as existing MPEG-1 files, to a VCD compliant MPEG-1 file. 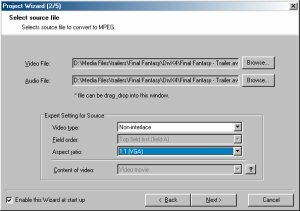 First, you'll have to find out how your current movie file is encoded, so you can convert it appropriately to one of the above VideoCD standards. This is done by checking the frame-rate of your current video, and to see if it is the same or a multiple of one of the above standard's frame-rate. You do not really want to do any unnecessary frame-rate conversion unless you absolutely have to, since frame-rate conversion can cause skipping, audio desynchronisation and will take longer. Once you know the frame-rate of your existing movie file, you can now choose to encode your VCD compliant MPEG-1 file to one of the standards above (NTSC, NTSC FILM or PAL) - just choose the format that matches your movie's frame-rate closest, or is a multiple of one of the above frame-rates (eg. if you movie has a frame-rate of 15, choose NTSC because 15 x 2 is roughly 29.97). 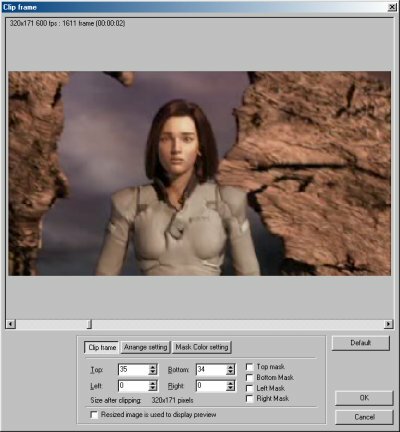 The second last screen allows you to choose the type of media you want to use to make the VCD. You should probably choose either the "CD-R 74min (VCD/SVCD)" or the "CD-R 80min (VCD/SVCD)" option. This window also shows you the amount of space the final video will take (on your 74/80 minute CD-R). The last screen allows you to choose the output location of your VCD compliant MPEG-1 file. The options further below allow you to process this conversion as a "batch" job (allowing you to convert many files at once, without having to stop in between), or to start up this job instantly (as a once off thing). If you wish to do additional processing/filtering on the input, deselect the "start encoding immediately" option now. Press "OK" when you are ready. After encoding for a short while, you should now have a MPG file that is VCD compliant and ready to burn onto a CD-R. To find out how to burn a VCD compliant MPG file to CD-R as a standard VideoCD, please refer to this guide. If you want to do additional processing such as cropping, please read on below for further instructions - note that the below instructions assumes you have followed the above steps and HAVE NOT yet encoded the VCD compliant MPG file (ie. you deselected the "start encoding immediately" option and have not pressed the "Start" button to start encoding). You may not want to encode the entire input file as a VCD, and this is why we may need TMPGEnc's "Source range" option to select the part you want to encode.